My broadband connection is currently slowed down to a bleep. My brother was here for Christmas and New Year, so between the 2 of us , we really made Telstra run for the money. 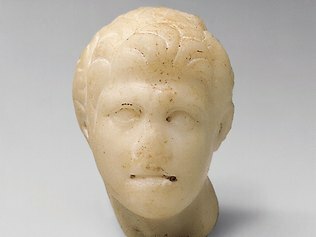 I think this is a good time for me to try my hand on writing a review on the exhibition ‘Alexander The Great: 2000 Years of Treasures’ currently running at the Australian Museum. Picture taking was prohibited in the exhibition, so I shall try my best to scout some pictures on the internet for graphical appeal. Surfing the net for information and uploading the pictures will be a pain in the arse, but I shall try my best. 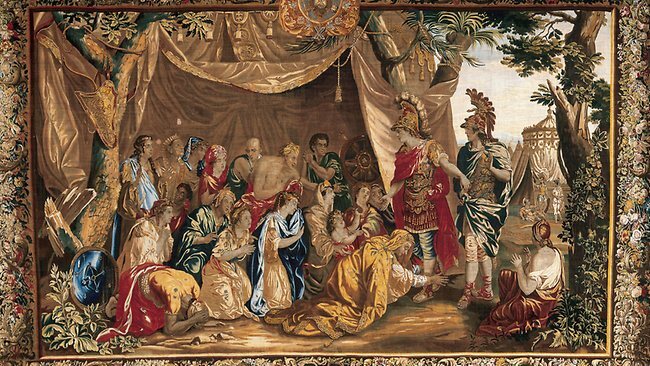 Invitation and Welcome: A huge colourful tapestry depicting Alexander The Great and the family of Darius was on the entrance wall. The visitor is invited to meander around the statues of Greek Gods Heracles, Eros , Meleager who had significant influence on Alexander. Space 1 : An Introduction of Alexander. Who is Alexander? Well, he was the son of Phillip and Olympias – a pair of bickering parents – sounding familiar? I only gave the pots and architectural pieces a cursory look. The famous black Statue of Cleopatra from Egypt is there too. My favourite is this piece of Gonzaga Cameo potrait of Ptolemy II and Arsinoe – and it’s big! The large coin collection is part of Alexander’s self-promotional propaganda – clever, since every person in the Empire needs money. Since the coins were small, so there was an interactive touch screen TV which flips the coin, so one can see the reverse of the coin. I think this is very cool, and the children loves it! The use of time-line on the wall to trace his campaign and conquests is a good idea; both to gel the various exhibits and to guide the visitor. The time-line is accompanied with a snapshot/ background info of the war. The walk-about in Space 2 came to an end in the central rotunda with a video animation showing that sportsmanship was a big part in the Hellenic era , which was rather entertaining and still applicable to this day: The Greek-style earthen pot comes to life showing a man throwing a javelin, running, boxing and chariot racing. Well, nothing has changed much, except chariot racing is now replaced by Formula 1 racing? Still, how did Alexander The Great died? Nobody knew for certain, but it is definitely MURDER! Space 3: Alexander’s cultural legacy and influence. Down the ramp to Space 3. This is an even bigger room in my opinion -perhaps due to larger spacing and brighter lights – more artifacts follow, but now the bits and pieces of his influence in art, culture, engravings, tapestries are starting to get tedious. I have used up my concentration and can’t help feeling overwhelmed. But do check out the armor made from ivory with details of lions at the weaponry section. The Ancients were really tiny, a Size 0, in modern couture sizing. And, Yes, I got the idea that Alexander the Great had successfully spread Hellenistic ideas around the world. In Biblical studies et al, women are subservient to men, but here Catherine The Great outshone all the men and showed that women can be as good as men or even greater! Anyway, the reason why The Hermitage Museum in Russia had amassed such a big Alex collection is because the Russians believed themselves to be to be the Byzantine descents of Alexander The Great. Catherine used Alex as a role model and believed herself to be a direct descendent of Alex and thus added ‘The Great’ to her name. Space 5: A modern take on Alexander’s influences. PS: Don’t forget to scan the QR reader for handy on the hand info! This entry was posted in Museum, Sydney and tagged Alexander The Great Exhibition, Australian Museum, museum curation, museum review. Bookmark the permalink.